Mark Cavendish was simply the fastest cyclist in 2009. The 24-year-old Manxman won a history-making six stages in the Tour de France and his final victory in Paris was extra special as he became the first Briton to win on the Champs-Elysees. During the Tour, the Team Columbia rider wore the prestigious Green Jersey and in the early stages of the Giro d'Italia he wore the leader's Maglia Rosa jersey. Cavendish won many stages in many races throughout the season - with another highlight being his victory in the Milan-San Remo Classic earlier in the year. 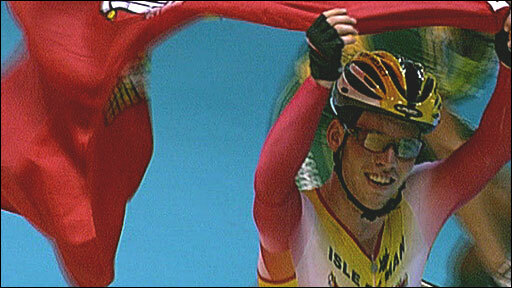 Isle of Man's finest has been successful in track cycling, too. The speedster won gold in the Madison with partner Rob Hayles at the World Track Cycling Championships in Los Angeles in 2005. And the following year he sprinted to gold in the scratch race at the Commonwealth Games while competing for his island. In 2008, Cavendish picked up his second Madison world title, this time with Olympic gold-medal winning Bradley Wiggins in Manchester.